Over 80% of business card in Singapore is using digital printing process. Even though, digital printing is lower resolution then offset printing process. But the process is simple and fast. 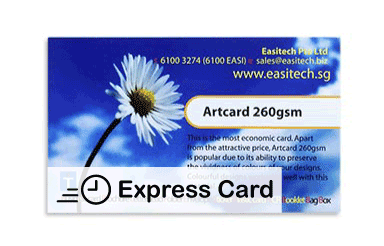 Easitech provides digital printing for customer who need business card in short time frame. In general, the business card will be ready for collect in 2 working days upon order and artwork confirm. Only self collection available for this name card option, collection address will be provided once order confirmed. Note: Premium Business Card is more economic if your printing quantity is high. Click here to download namecard template in adobe illustrator format. 2.Bleeds are required in all artwork with an image extending to one of the borders. Add 2mm on each sides to allow for cutting (example bleed size for standard sizeis 92mmX56mm). Refer to diagram above.